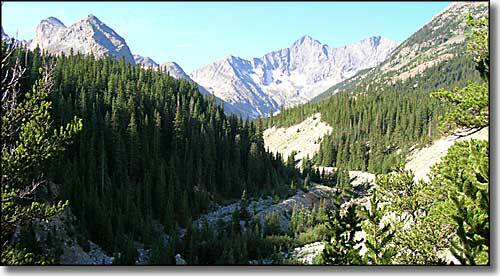 The Sangre de Cristo Mountains are one of the longest mountain chains on Earth. They stretch from Poncha Pass, Colorado, in the north to Glorieta Pass, New Mexico, in the south. There are ten peaks over 14,000' high in the range, more than two dozen over 13,000'. Miles and miles of excellent alpine hiking trails through millions of acres of the San Isabel, Rio Grande, Carson, and Santa Fe National Forests. 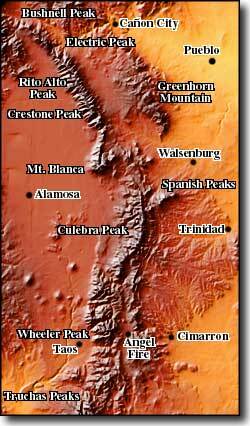 The Sangre de Cristo, Wheeler Peak, Latir Peak, Pecos, and Spanish Peaks National Wilderness Areas are found here. Some of the best rock climbing, snow skiing and whitewater rafting on Earth are also right here. The Trinchera elk herd is one of the largest in the world. Rocky Mountain Bighorn Sheep are found all through the range. If it's fly fishing you want, we have Gold Medal waters to offer. There's also the Great Sand Dunes, the Spanish Peaks and three major ski areas. The Sangre de Cristos are fault block mountains with major fault lines running along both the east and west sides of the mountains. In places, there are also fault lines cutting right through the mountain chain. The mountains were pushed up about 27 million years ago, pretty much as one big chunk of rock. On the west side is the San Luis Valley with the Rio Grande Rift Zone running down the middle. On the southeast side is the Raton Basin with a quiet but still active volcano field. On the northeast side are the Wet Mountains and the Front Range, areas of pre-Cambrian rock raised up during the Colorado Orogeny some 1.7 billion years ago. The Blanca Massif is also pre-Cambrian rock while the main body of the Sangres themselves is composed of Permian-Pennsylvanian rock and a mix of igneous intrusions, conglomerates and shale that is only about 250 million years old. On the satellite image to the right, between the Spanish Peaks and Angel Fire you can see the fault lines in the ground: the high ridges of the folds being parts of the Dakota Wall that stretches from Canada to Mexico along the eastern boundaries of the mountainous uplifts (from the Spanish Peaks area north, the Dakota Wall skirts the Wet Mountains and heads north to that area just west of central Colorado Springs known as The Garden of the Gods, and then continues north along the eastern foothills of the Front Range to the Flatirons outside of Boulder). There are some pretty big chunks of Dakota sandstone sticking up to the west of the Sangre de Cristo's but those pieces were turned upright about 65 million years ago during the Laramide Orogeny when the Ancestral Rockies first pushed up. So when you look at the ages put on these events by the geologists, what we are seeing now is the results of 25, 27, 65 million years of erosion, glaciation, volcanic activity, and continuing uplift, in contrast to 125 million and more years ago when this whole region was serving as the bottom of a shallow sea. 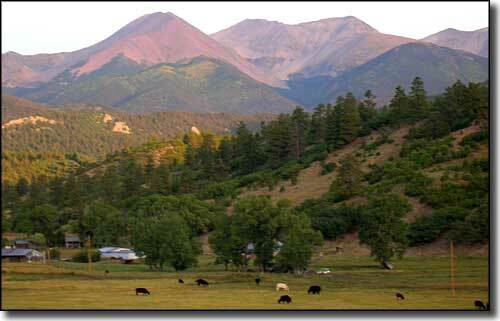 When the Spanish Peaks were first formed, about 25 million years ago, the top of the West Spanish Peak (which is now at 13,626 feet above sea level) was about 2 miles below the surface of the Earth. On the west side of the Sangres in the San Luis Valley and running southwards is the Rio Grande Rift. The San Luis Valley itself is a huge gravel pit full of eroded materials from the Sangre de Cristos on the east and the San Juan Mountains on the west. Bedrock is down about 30,000 feet (with the floor of the Valley at about 7,500 feet above sea level, that bedrock is miles below today's sea level). There is a lot of water stored in all that gravel and, below a certain depth, that water is hot. There are hot springs bubbling to the surface through the center of the San Luis Valley and in spots along the sides of the Rio Grande down almost to Santa Fe. There's also hot springs further south at Truth or Consequences (which used to be known as Hot Springs, NM, before that famous television show from fifty years ago convinced the local folks to change the name). There's the northern Sangres: running southeast, then south from Poncha Pass to Medano Pass. This is primarily one big block of eroded Permian-Pennsylvanian rock that runs between two north-south trending fault lines. Prospectors worked these mountains over pretty heavily but only found calcite (and related minerals) near what is now Howard, iron on the west side of the range near Orient and gold in small quantities near Crestone. Then there's the "pre-Cambrian Gap" between Medano Pass and Iron Mountain. 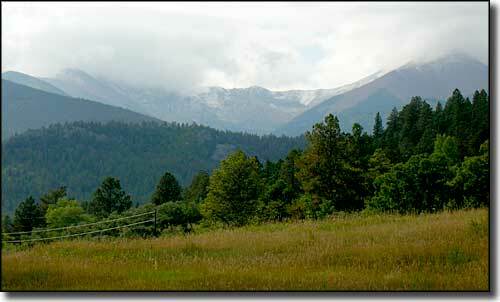 This is the area that rises to Blanca Peak, Ellington Point and Little Bear Peak with Mt. Lindsey just to the east. This stretch of rock is mostly pre-Cambrian granite that was solidified in place much longer ago than the rest of the Sangre de Cristo chain. It may have been the overlying presence of all this ancient granite that stopped the uplift of the rest of the Sangre de Cristos in this area. The mountain-causing fault lines are to the east of the pre-cambrian granite but in this area, nothing was pushed up. It may have been the extreme build-up of magma pressure deep in the ground that caused the intrusions that we see today at Mt. Mestas, Rough Mountain and Silver Mountain with its radial dikes. The same goes for the creation of the Spanish Peaks and that set of radial dikes to the east of the northern end of the Culebras. A couple of minor gold strikes were made at the bottom of the bowl between Blanca Peak and Ellingwood Point and that's it. The Culebra (or Snowy) Range runs from Iron Mountain south to Costilla Creek. This is another long fault block uplift of Permian-Pennsylvanian rock. Some gold and silver were found near Iron Mountain, near Silver Mountain and around the West Spanish Peak. Above treeline on several peaks in this range you'll also find the remains of uranium digs from the 1950's. Some areas around Culebra Peak itself, to the west and south, are pre-Cambrian rock, raised up during the Laramide Orogeny, about 65 million years ago. From State Line Peak south to Glorieta Pass are the southern Sangres. There are two branches of the north-south trending mountain chain here. To the east are the Cimarrons, to the west are the Sangres and in the middle is the Moreno Valley. Gold and silver have been found in the Cimarrons. Some gold and silver were found in different parts of these Sangres but the biggest mine workings in the whole length of the mountain chain are between Questa and Red River at Molycorp, a huge molybdenum mine.